I'm learning a lot about style and formatting from other bloggers. I'm much more used to writing academic style documents that have to be spoken with rhythm and pace in a time slot. If that sounds an odd combination, then go listen to a High Anglican service that has been translated to English from the original Latin. Done correctly and with insight and imagination, it's quite beautiful. In fact, I'd recommend just going, closing your eyes and whatever their saying, listening to the lilt, ebb and flow. The subject doesn't matter. Then go and play with what you've learned. Listening to other people isn't for every writer because they either cannot, or worry, about external influences. Personally, I can compartmentalize influence. Apparently, I'm quite ill. I'm told I'm dropping off unexpectedly and I'm a 'funny colour' Nah, tired. I slept 8 hours, followed by a stint of 16 hours. I've been a 4-6 man all my life. Not uninterrupted - over the last three weekends the next door neighbors have been out of their heads on something(s) doing Karaoke 80's hits until 3 am with a lot of 14-17 year old's, which is bearable now and again. But this weekend another neighbour called the police because his van windscreen was smashed, his bathroom window broken, and as I discovered the next morning, my little wireless weather station has been broken, for the second time. I don't think I can repair it this time. I have to find at least £80 to replace it. Police can't do anything. I have to prove a link, apparently. I Have To Prove? Crikey. Hasn't the police force changed? I've been gifted another 12 lb of Cooking apples, so it looks like Chutney all round this Christmas. A neighbour is landscaping their garden, and decided to strip their tree and prune it. Luckily, they waited to towards the end of September - I was given 8 lb in July last year, which is way too early, it really should be October. However, September is about right for me, because they're just immature enough for me to store them the old fashioned way. I'll beg, borrow, barter or make some wooden boxes, as the total apple count has reached at least 17 lb. In the bottom of each box will go sharp sand, followed by cleaned apples, covered with dry sharp sand, more apples and so on until a final layer of sand. They'll be stored in Jabba, one of my huts which is cool and dark. Jabba, constructed of floorboards and bitumen served for best part of a hundred years as a farm laborers tea hut in a windswept field at Bolsover. No way were we going to see that on a bonfire. Grumpy aged father in law replaced the rotten roof with corrugated steel and bitumen, melting his boots in the process. Now it just needs a yearly coat of Ronseal. The same technique works well with hard fruits and root veg too. Pears, Potatoes, Carrots, Swedes, beets and turnips, and in little pots of sand, seeds. The fruit and veg I have left will store to at least March. The downside, if you see it like that, is that throughout the winter you won't dig out shiny, firm, waxy looking things. They soften, wrinkle and sweeten, and occasionally ferment a little. Which makes for an interesting chutney. 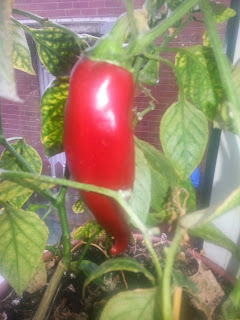 After most of my little veg crop failed last year because it was so wet, I didn't bother this year. 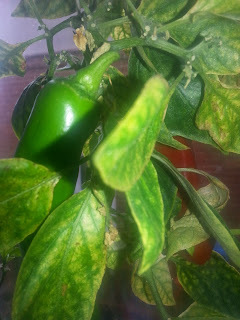 Instead I concentrated on growing my indoor chilies and capsicums and my fruit trees. All two of them, an apple and a plum. The chilies and capsicums (peppers) I grow the really, really lazy way. I know I could get someone to fetch me seeds from a garden center. I won't buy seedlings anyway, because they tend to be sickly and pathetic hydroponic things shocked into compost. Besides, they cost money, if only in travel costs. Nah. You know the peppers you buy from the supermarket? The immature seeds you throw away? Not I. Homemade compost from veg left overs, and seeds that have been left to dry on a tray for a couple of days. My success rate is about two out of ten seedlings. But that's no problem, when you're chopping up peppers for cooking you get hundreds. This is northern UK, and you'd be lucky to get the 19 - 25 C that they need, so three Chilies per plant is great. I just water them when their compost feels dry, and use tomato food, about 15 ml per 500 ml water once a week. These Chilies are 7 inches long and still growing. It takes very little effort. I'd be the first to admit that since you can buy them, why bother? Because I can. And because it costs me little more than liquid tomato food from the local Nissan shop. Meanwhile, the Apple tree was planted temporarily under a willow. So no fruit this year. But The Plums. Oh boy. They are a month early, and we are picking those every day. Often, 5 lbs a day, including windfalls. 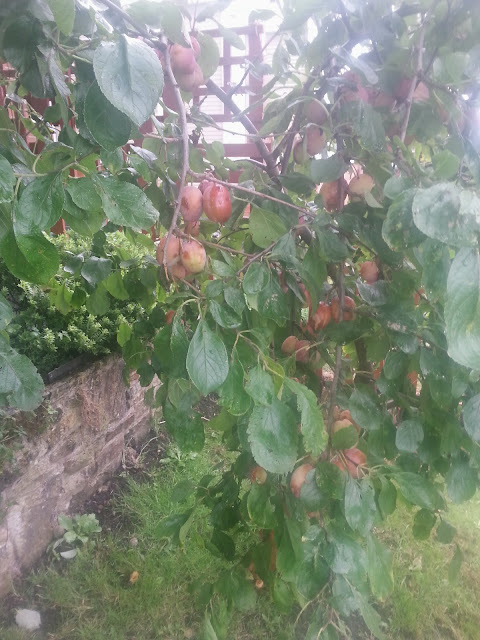 So it's plum jam, dried plum, frozen plums, plums preserved in syrup, plum sauce, chutneys and plums I can barter for apples, damsons, rose hips, whatever someone has an excess of. Plum and Chilli Jam, which by the way lasts for a year, seems popular. Meanwhile, time to dead-head the lavender - which will be eaten or bartered one way or another. Likewise with the rosemary, closely related to and interchangeable with lavender in recipes. Oh, and those little white flowers you can see behind the plums above to wall on the raised bed? That's garlic that I planted two years ago that a rather planting adverse relative who sharpens trees into pencils, dumped two feet of home made compost on a year ago. That's going to great in salads and stews, even if we find no cloves beneath. I'm totally plum'd out. Phew. Very frustrating couple of days. Along one side of a fence in the front garden I have an 20 foot strip, about two feet wide that was originally gravelled. I just topped it up every couple of years. However, due to wind and rain most of it ended up on the neighbours path. They've never complained, but I overheard them grumble to themselves as they swept up. Fair point I thought, did a quick cost analysis and taking into account how much it was costing me for a relative to fetch me the Yorkshire stone gravel, the price of it, and the work involved - it's cheaper to turn it into a flower bed. So I went to Jabba (my hut) to fetch my spade and rake. No trace. Upshot is they've been given away because someone decided I didn't need them. It's only 10 days since I used them. I promise, that very quietly, I asked for them to be retrieved. I was met with some very blank looks. "Why?" Who, I asked, keeps the garden in shape? Prunes, shapes, weeds, plants? "Well, we cut the grass....?" Yup. True I can't do that. But I do potter about and do a little at a time that adds up to a lot. A little pleasure. Gardens are more than a trim. They don't look after themselves. Any-ways, seemed I wasn't getting through. "But it's always looked like this?" Thank you, I said. I want all the tools back please, meanwhile, dump those grass cuttings on that bed, it'll make a good mulch. "No" I was told. "It's getting gravelled, it's always that way". That's from someone who doesn't live here. They'd decided it was "Best for me" and I could "pay them back at a bit a week if I wanted". If I may be blunt. Sod That. Unfortunately, I now have to visit those who have been given the garden tools and negotiate their return. Won't be too difficult. It's autumn, it's jam making season, and I'll negotiate with my rather delicious home made preserves on a loan back and exchange and then return basis. What has happened here is something called Disableism. I'm no stranger to it. It's when people, often with the best of motives - to be kind, to be helpful, do what they think what is best for you, without asking you, and perhaps without realising it, make assumptions and take control. They don't mean any ill will. It's somewhat complicated. But lets put it this way. I have a mate born with cerebral palsy in his forties who is very demanding and has a habit of getting drunk and crashes into lamp posts on his mobility scooters. At first, he left me scratching my head in bemusement. Then we had a good chat. Realised I was talking to a chap who is highly intelligent who was rebelling, and as he explained, was going for it. "I'm single, live in my own" he explained. "I'd rather make mistakes my way"
Going through a load of forms, mainly medical related and correcting boxes where it's been prefilled. Mainly where it says 'unemployed'. Because I'm on benefits doesn't mean I've ever claimed unemployment benefits. It's an anomaly in the system. If you don't claim certain benefits, various Government departments chase you up wanting to know why the heck not. Which would be amusing if it wasn't such a nuisance. So to stave off fighting off bemused office workers with a pointy stick, I go here every few months. Yup, the UK Government has it's own website where you can check. You may well be surprised. Many people I know - the bloke next door has two jobs - are on one or more benefits, and correctly so. Despite what some in the media would have people believe. In an era of long hours and low pay, that's no great surprise. Our fuel supplier has just advised us to apply for the Warmhome allowance. Run in conjunction with the Government, and financed by the fuel suppliers, at some levels of benefits, particularly health related, £135 is available this year as a deduction from the first quarter of the 2014 bill. Every company has it's own policy and implementation. Some, if they know which benefit you are on do it automatically. This is different from age related fuel grants. Warmhome is paid as a credit into your account, even if you use Prepay (so-called 'key') meters, and separate from Cold Weather payments. The Head MRI scan went ok. It was certainly an experience. I had been warned they may use a head restraint, maybe some kind of face mask because you have to be very still and that it was quite noisy and claustrophobic and last 30-45 mins. As it happened, they gave me a little rubber bulb thingy to squeeze in case I needed anything, and a pair of headphones to minimize the noise. I was laid on a table on some tissue stuff, and they rested my head and feet on pillows. Then they slid a semicircular plastic shield with a white stripe across it across my head that was about, I dunno, maybe 6-8 inches above my face. A voice in the headphones asked if I was ok, then the table slid into the scanner. I didn't feel in the least claustrophobic. There was a lots of buzzing, whirring and clunking, but it wasn't loud. The table moved slightly a few times, so I just closed my eyes relaxed and worked through some maths. It seemed about 7 or 8 minutes, but as they helped me out I asked whether I was still enough to which they said I was, and when I commented that it took a lot less longer than I expected, they said most people complain 30 mins is too long. On the way back to Anne I got a sneak preview of a couple of slices of my brain. Yup. I memorised a bit of my brain. It appealed to my Arty side.